So as an update to my last blog post, I am now three days into my Kindle Scout campaign. I submitted my newest romance novel, Remember Me Always, into the Kindle Scout program. My campaign started on April 1st, and it will run until May 1st. My advice for anyone who is interested in submitting a novel to Kindle Scout in the future would be to utilize all of your resources right out of the gate. I did a lot of self-promotion the first day, and my book ended up on the Hot & Trending list. There are only 20 books on that list, and Kindle Press shows the list on the bottom of every book page and at the top of their homepage. So they are basically showcasing your book for you, which is a huge plus!! So how exactly do you self-promote yourself? If you have an email list, send out an email informing everyone of your campaign. Tell your friends and family. Remember that anyone with an Amazon account can nominate you, and every nomination counts! Post on Facebook, Twitter, Pinterest, etc. Share your promotion in Facebook groups. Join a Facebook RT team for Twitter. There are a LOT of ways you can self-promote your campaign, but I will warn you — it is time-consuming! So how is my Kindle Scout campaign doing so far? Well, I’ve been in the Hot & Trending list for almost the entire time (save for the first few hours of my campaign on day number one). As I said in my previous blog post, I think being on the Hot & Trending list is vital to having a successful campaign. Also, I’ve had hundreds of total page views. I’m not sure how much the total page views matter. In my research, I saw that a person with 5,000 views did not get published with Kindle Press, whereas a person who had a little over 1,000 views did. So as of right now, the total page views are not as important as the Hot & Trending list, in my opinion. If you would like to nominate my book, please go to my campaign page. Thank you very much for your support, and I hope you enjoyed this blog post. Below is some information about my novel, Remember Me Always. When the event opens, feel free to start posting. The event is running from Saturday 1/3 to Monday 1/5, so you have plenty of time to run a giveaway all weekend and pick a winner on Monday, if that’s your preference. If your giveaway is for 18+ or US only, please indicate that. You can bump your giveaway post as long as it is still active. When your giveaway is over, please edit your post and type “**CLOSED**” before the first word in the post. **UPDATE** Check out this blog post about the giveaway. 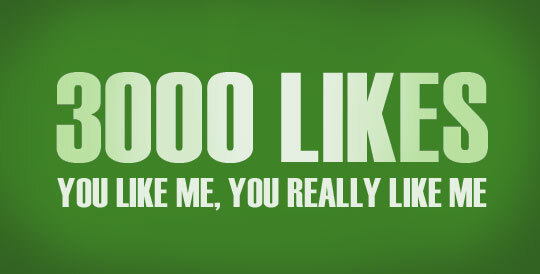 Today I reached 3,000 likes on my Facebook page!! To celebrate, I am planning on have a huge giveaway with authors and bloggers. The giveaway will be in the form of a Facebook page event. Everyone is welcome to join, as it will be open to the public. If you have never been involved in one of these, allow me to break it down for you. Basically, an author/blogger will donate something in the form of books, swag, gift cards, etc. They run their own little mini giveaway on the Facebook event. What that means is you post in the event with any images you want (book covers, book teasers, banners, etc. ), what you are giving away, who is eligible to participate (US only or worldwide) and what the participants have to do in order to win. The attendees of the event will participate in these little “mini giveaways” and follow the instructions of each giveaway post in order to be eligible to win. Now, what do they have to do to win? It could be almost anything. You make the rules, and you are responsible for your own giveaway. Your giveaway can be as simple as like, share, comment. If you want to make them work for it, you can get more Facebook page likes, Amazon author page likes, blog likes/comments/subscribers, etc. So what’s in it for you for running a giveaway? It depends on what you ask the participants to do. You can gain Facebook page likes, new subscribers to your blog or newsletter, comments/likes on your blog, Amazon author page likes and so much more. It’s a way to gain followers and attention for new releases fast. These events are great for indie authors especially, because you’re getting your name out there, your book cover images/teasers and so much more to a lot of people who may have never seen your work before. If you would like to donate books, e-books, gift cards, swag, etc., please go to this Facebook post and vote on which weekend would work out best for you. Once we settle on a weekend, I will create the giveaway and post about it on my Facebook page. The Rafflecopter giveaway to celebrate 2,000 likes on my Facebook page is underway! Starting today, 6/6, you have a chance to enter to win some great books and prizes until 6/27. Up for grabs is a signed paperback copy of Vampire Next Door. There is an option to tweet about the giveaway, and you can do that once a day to gain points. Follow the link below to check out the giveaway. You can find all of these books on Amazon.com and other book retailers. Support an indie author. Buy a book and tell your friends. Word of mouth is one of the best things you can do for an author. Update: This giveaway is now closed. Thanks for everyone who participated!! 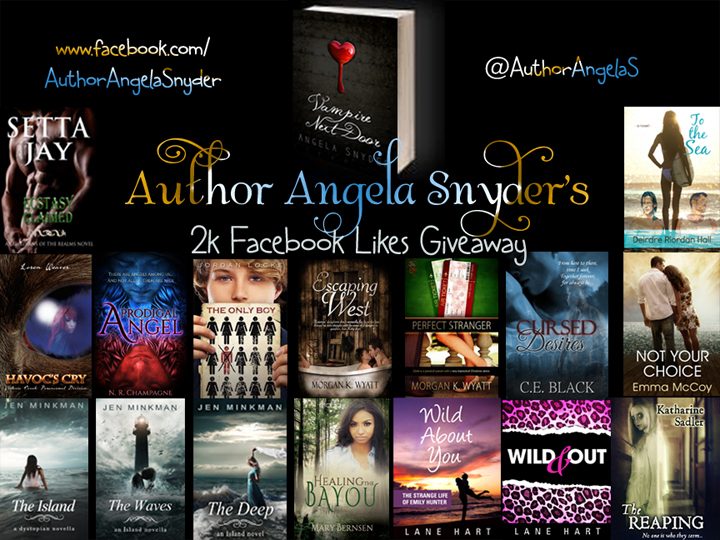 To celebrate 2,000 likes for my Facebook page, I am hosting a Rafflecopter giveaway. I have a dozen of very talented authors who donated books to the giveaway. There are signed paperback books, e-books and more. Up for grabs is a signed paperback copy of my book, Vampire Next Door. The giveaway starts on Friday, June 6 and ends on Friday, June 27. Don’t miss out on these great books! Update: The form is now closed. Thank you to all the amazing authors who are participating in the giveaway! I am almost to 2,000 likes on my Facebook author page. To celebrate, I want to have a huge Rafflecopter giveaway. I’m inviting all you indie authors out there to donate a book, ebook, swag, Amazon gift card, etc., to the giveaway. What can you donate? E-books, signed or unsigned paperback books, Amazon gift cards, swag, etc. Please specify when filling out the form what you are donating, i.e., title of the book, what kind of book/donation it is. How do you donate? It’s very simple! I will send you a link to a Google docs form. All you do is fill out the info, and I take care of the rest when I make the Rafflecopter giveaway. When is the giveaway taking place? Soon. I would say within the next week or two (beginning of June). I want to get enough authors together to make this worthwhile. I am almost to 2,000 likes, which is what I am celebrating, but I will start the giveaway as soon as I’m ready. I will email you with the exact date and a link to the giveaway so that you can share it via social media. How do you contact the winner/winners? Once the winners are picked by Rafflecopter, I will email you with the winner(s)’ information. You will then have to deliver the winner(s)’ prizes to them either electronically or by mail. We are working on the honor system here. Do not fill out the form if you are not intending on sending the prizes to the winners!